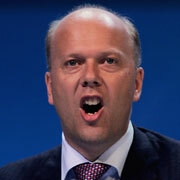 Chris Grayling said again today that violent crime has gone up under Labour. Two independent factcheck websites have undermined his claims. Chris Grayling’s credibility appeared to be on the line today as two independent factcheck websites undermined his claims, reiterated on Radio 4 Today, that violent crime has gone up under Labour. “The two main sets of violent crime statistics show completely opposite trends. “In the blue corner, recorded crime figures – which are affected by changes in the way crimes are counted by the police – do show a rise. But in the red corner, the British Crime Survey, which asks people about their experiences of crime, shows violent offences have in fact decreased by more than 40 per cent. “The BCS, as all parties accept, does show declining levels of violent crime. “The official figures do not back up Chris Grayling’s claim. Full Fact also criticised Alan Johnson for claiming that “crime had doubled” under the Conservatives. Left Foot Forward has, for weeks, challenged the shadow home secretary to publish the House of Commons report, cited by the Spectator this morning, on which he bases his figures. We have also shown that three measures of violent crime has fallen, including both his preferred measure.